It’s the call we hate to love. A customer reaches out to us to solve a problem because their current system isn’t working. We love that they thought to call Mallard. We hate that they have a system that isn’t working for them. The good news… we know we can help! In this example, a major auto parts distributor placed the “help” call after finding themselves in order fulfillment chaos. They had an impressive, albeit older, multi-level pick module, complete with a pick-to-light system. The goal was to consolidate their order selection footprint for faster and more accurate order selection of cartons and each picks. Unfortunately, this “best laid” plan had another, not so efficient outcome. 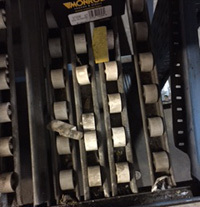 The cartons, which came in a variety of shapes, weights and sizes, didn’t flow as expected on the carton flow lanes; smaller cartons fell-through the lanes, others shifted off track and caused caused carton hang-ups, leaving this distributor with a messy and costly challenge. They learned all too quickly that a pick module is only as only as efficient as all of its moving parts; most critical being the carton flow shelving itself. It must deliver… literally. This is even more important in a pick-to-light system – without a carton in the very front position, the expensive technology is of now use. Mallard knew where the carton flow configuration failed; it was designed for larger and/or more consistent carton sizes. The tracks they selected were affordable and lightweight, but also more susceptible damage for day to day use. Tracks would also need to be moved for product re-slotting. We had just the fix – one that didn’t require a costly redesign – Dyna-Deck carton flow replacement shelves. A full sample test level was installed and provided the proof they needed to make the switch. We developed Dyna-Deck to meet the widespread need for replacement of inferior, damaged case flow rails and wheels. Heavy duty, low-profile Dyna-Deck tracks, available in 12″-16″ widths, drop right into existing carton flow shelves, forming a solid wheel bed solution that provides full wheel coverage for varying carton sizes. Shelves are easily reprofiled for changing SKU requirements without moving tracks. Give us a call if your carton flow shelves could use or face lift or if you need help designing a new system. We’ll design your module to effectively optimize space and improve picking productivity.